The objective of the game is to win the race at all costs, and that means taking down other racers by whatever means necessary. This includes crushing them and devising all sorts of trickery to get the better of them. You can race against your friends or go up against random players from anywhere on the planet. If you played the original game, then you already know that your goal is to finish the race before any of the other furry creatures in the game do so. It’s a cute, fun game, and the level of “violence” that you can employ is what makes it a blast. The game, which is available on Android and iOS, allows up to four players to play at the same time, which translates to a lot more fun, and it can be addictive actually. 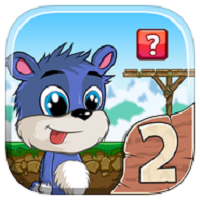 As far as multiplayer running games go, Fun Run 2 is right up there, and the cartoony violence complements the graphics. The gameplay is smoother than in the previous version, and that’s not surprising given the fact that the system is brand new. Apart from the new graphics, new power ups, themes and levels have been added, and there’s customization as well.